Collaborative teaching, sometimes called cooperative teaching or team teaching, involves educators working in tandem to lead, instruct and mentor groups of students. Collaboration most often occurs among professionals from various disciplines including core subjects, special education, elective courses, library science or guidance programs. On some occasions, teachers from the same department or grade level may team teach to target multiple levels of learning or provide a greater variety of supervised activities for students to practice skills. Collaboration can be implemented across all instructional levels and subject areas. To be effective, the art of collaboration requires thoughtful consideration on the part of educators. Time must be set aside for developing lessons and deciding on appropriate learning approaches to use with specific students or groups. In many schools, administrators set up collaboration schedules a year ahead in order to ensure that teachers will have shared planning times. Even so, many collaborative teachers spend time before and after school to coordinate their efforts. 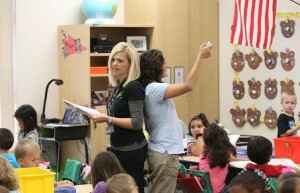 Additionally, deciding on which teachers will be paired together can make or break a successful teaching partnership. Collaborative teachers need to bring their best strengths and practices to the team while remaining flexible to adapt to new methodologies that can benefit student learning. In this way, teachers continue to grow in their professional skills and students gain understanding from a variety of instructional approaches. Team teachers must also present a united front so that students perceive each as being of equal importance in knowledge and authority thus leading to more respectful learning environments. Lead, Observe, Assist – One teacher presents new content while the co-leader observes students and assists any who may be off-task or struggling with concepts. Teach and Reteach – The lead teacher presents new material and activities while the co-instructor reviews previous information and skills for retention purposes. Simultaneous Teaching – The class is divided into two smaller groups and both teachers present the same material at the same time. Instructional Stations – Students rotate between several stations to receive new instruction or work on activities monitored by teachers. Supplemental Teaching – While one teacher instructs the majority of learners, the other takes a small group aside to work on different instructional goals related to readiness or literacy skills. Co-teaching Rotation – Both teachers present new information rotating between presentation and support roles during the lesson. Collaboration is a wonderful teaching tool. Teachers have the opportunity to assess and differentiate instruction for students more readily and they can learn new instructional techniques from one another to expand their teaching repertoire. Cooperative teaching experiences also provide mutual support and assistance for planning and implementing lessons, assessing students’ progress, sharing professional concerns, and addressing students’ learning needs. Most importantly, teaming allows more opportunities for students to understand and connect with content thereby maximizing individual learning potential. Considering the number of ways that team teaching can be used effectively in the classroom, it is no wonder that it remains a popular instructional model. Collaborative teaching allows teachers to impart information to a broader range of learners using approaches that spark students’ imaginations while supporting individual learning differences.